How To Observe Ugadi Festival? Ugadi is the Kannada and Telugu New Year in Karnataka, Andhra Pradesh and Telangana. 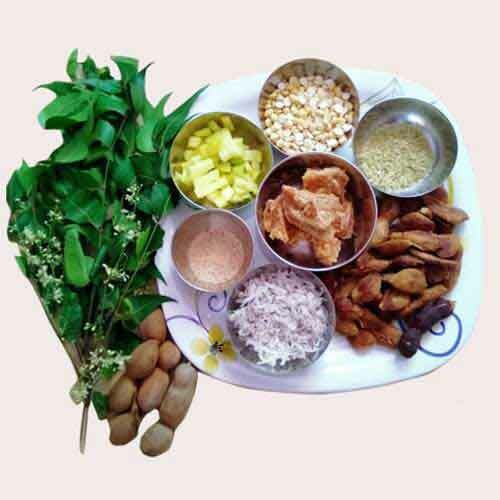 This is a short description of how Ugadi is celebrated in Karnataka and includes the important pujas performed, naivedya prepared, food and other rituals. The main to do list include – buying new clothes, Neem flower and leaf pachadi preparation, oil bath and Ugadi Panchanga Sravanam. There are slight variations in the mode of Telugu Ugadi celebration. The eldest female member in the house usually prepares for the Ugadi puja. Mango leave festoons or other decorations are installed on doors and windows. Ugadi pachadi or neem flower with jaggery is prepared. New clothes for family members are arranged before the deity or in the puja room. A small mark using a pinch of turmeric and kumkum is made on the new clothes, mostly on those areas which is not easily visible. Next is the oil bath. A through oil bath with sesame oil or other hair oils is a must on Ugadi. Usually children are given a good scalp oil massage by mothers. Then family members take a bath and are given new clothes. Now the family assembles in the Puja room. The Panchanga Puja is performed. Copies of New Panchanga are placed on a stool and is decorated with turmeric, sandalwood paste and kumkum. Some flowers, uncooked rice and turmeric are placed on the panchanga. A simple puja is performed for the deity in the Puja room. Next is the usual arati on the deity and the panchanga. Youngsters take the blessings of elders. Next Ugadi pachadi is eaten on empty stomach. Next read the panchanga especially the part which contains next year’s predictions. The traditional puja ends here. There are many Hindus who perform the Navagraha puja on Ugadi day. This is done by an experienced family member or priest. At night, it is considered highly auspicious to look at the moon. This is referred as Ugadi Chandra Darshana.